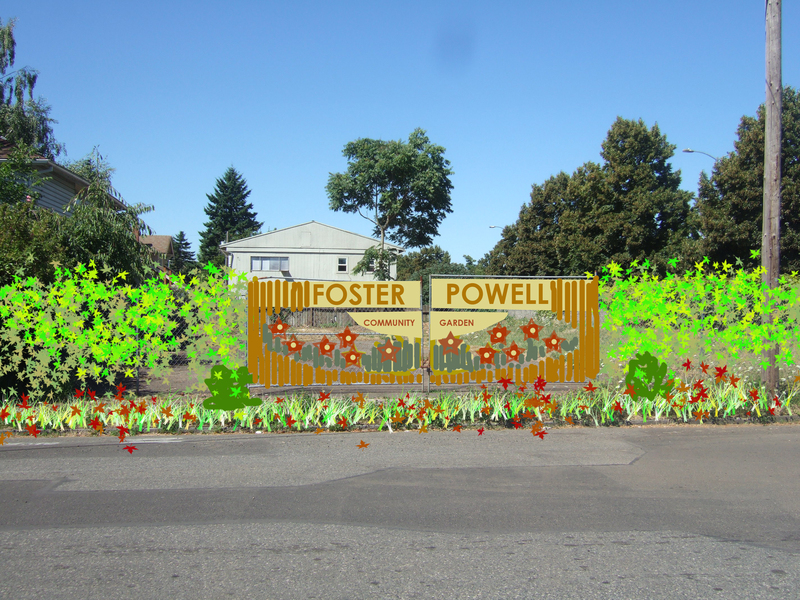 We made a garden plan and proposal to ODOT and last week our proposal was approved. There is now a neighborhood lock on the gate and we are free to begin working on the space while the permit is being drawn up. Some of the obstacles we have ahead and are (your input could really make a difference here): We cannot depave, we cannot build permanent structures, we cannot dig. Our only water source currently is a disconnected gutter from the adjacent apartment complex. We have no electricity. The organizing members of this project see this as a challenge not a hindrance so we are interested in solutions that meet these criteria rather than fighting ODOT for more permissions. Any bright ideas? 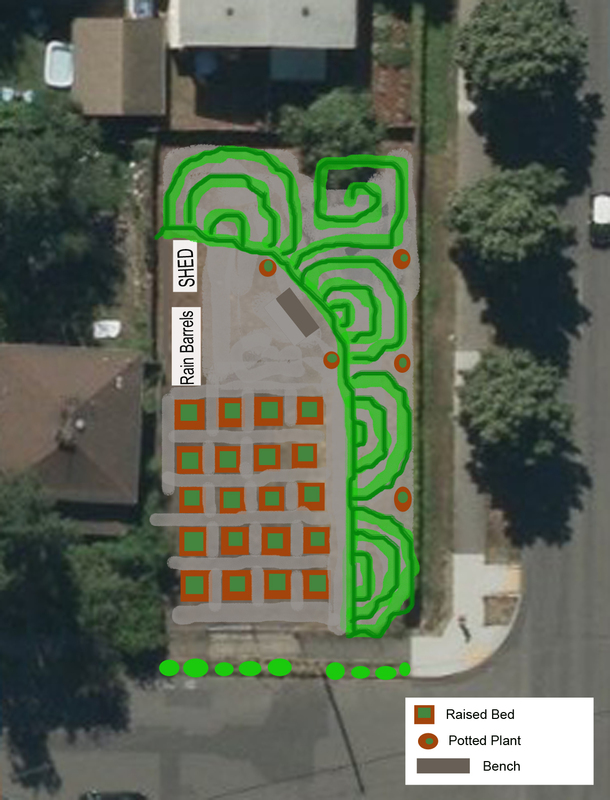 Our current approved plan is waist high raised beds out of palette wood on top of the asphalt, a rain barrel catch system. 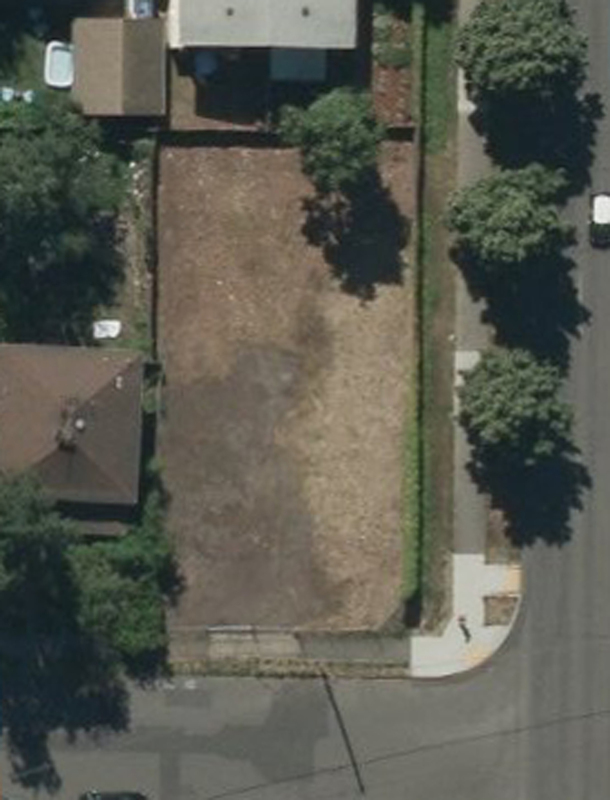 The right hand side of the ariel plan shows a strip that is unpaved. We proposed to put down cardboard over the dirt, build a dirt layer and retaining wall up and design that area with drought tolerant succulents and pea gravel. You’ll need a whole bunch of rain barrels for that many plots; a tank would be better. You’ll need about 200 gallons (4 barrels) per week in the summer, depending on how much you have planted. If it’s raised beds, you’ll have more dehydration if there’s air circulating under them (unless you seal them in with plastic or something). Also, don’t use old pallets. They’re tempting because they’re free, but they’re seriously treated and you won’t want them to touch soil used for growing food. Untreated wood is going to be a big expense unless you get it donated. Tough break on the pavement having to stay, but you can use that heat island effect to your advantage in growing tomatoes and peppers that don’t like the cold Oregon nights. Thanks for your comments! That is a lot if water! I agree that a tank would be better. I’m going to write a grant for one and perhaps we can have a water truck come and fill it when needed. It seems like using plastic linings (like I have on my own wood raised beds) would take care of two problems at once. It would hold the moisture and it would allow us to re-purpose that old palette wood without contaminating our soil. Don’t you think? An added benefit would be that it would slow down the deterioration of the wood and the beds would last longer. My beds are 5 years old and showing no wear. That sounds great. Good luck with this! we could have a water drive a few times it would be a good way for the rest of the community to participate maybe containers (milk jugs maybe?) left on the curb for a volunteer or two in a truck to pick up. Great job on the garden plans! I will stop by to check it out and let my friends at USFW know; they really love helping with native plant habitats. I’m excited to see this area revitalized! Excited to hear about this and help in any way I can…Laboring hands or moral support or a jug full of water run and lots of love. Have you talked to the “containrain.com” people? They’re really helpful and have donated barrels to some other projects, or provided them at cost. Neat little local business. I will certainly look into this. I have not heard of it yet. Thank you for the suggestion. I just tuned in to this and may I say IT IS AWESOME! I’m over in Woodstock but really applaud what you are doing. Seems like there may be grants available too for your project, or maybe you could partner with PSU’s engineering department? This would be a great hands on project for the students. Thanks so much for the encouragement! I looked into it as a PCC Service Learning Project (because I teach there) but I haven’t had time yet to follow up on it. I might be able to pull it together before Fall and I’ll look into PSU as well.